Cut out the frustration of waiting all week for the bank to clear your paycheck or benefits deposit by choosing Check Center. No matter the type of check or amount, we now have 3 ways for you get your money up to 2 days faster2. Benefits Express: Sign up for our Benefits Express program1 and your benefits will appear on your government issued debit card up to two days faster. Direct Deposit to a Prepaid Card: Have your paycheck or benefits check deposited on a Check Center Netspend® Visa® Prepaid Card account, and your paycheck or benefits check can arrive up to 2 days faster.2 To top things off, card carrying members of the Check Center family get 20% off check cashing fees. 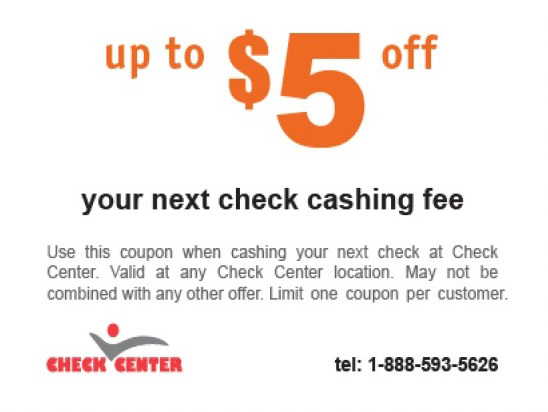 Whether you live in San Diego, Berkley, or Oakland, Check Center is the go-to for expedient check cashing with 17 locations across the state of California. Get in touch with the nearest store to you to get the process started. 2 Faster access to funds is based on comparison of Netspend’s immediate availability policy versus the typical banking practice of only posting funds after settlement. Direct Deposit and earlier availability of funds are subject to payor’s support of this feature and timing of payor´s funding. Check with your payor to find out when the direct deposit of funds will start. 3 IMPORTANT INFORMATION FOR OPENING A CARD ACCOUNT: To help the federal government fight the funding of terrorism and money laundering activities, the USA PATRIOT Act requires us to obtain, verify, and record information that identifies each person who opens a Card Account. WHAT THIS MEANS FOR YOU: When you open a Card Account, we will ask for your name, address, date of birth, and your government ID number. We may also ask to see your driver’s license or other identifying information. Card activation and identity verification required before you can use the Card Account. If your identity is partially verified, full use of the Card Account will be restricted, but you may be able to use the Card Account for in-store purchase transactions. Restrictions include: no ATM withdrawals, international transactions, account-to-account transfers and additional loads. Use of Card Account also subject to fraud prevention restrictions at any time, with or without notice. Residents of Vermont are ineligible to open a Card Account. 4 This optional offer is not MetaBank product or service nor does MetaBank endorse this offer. The Netspend Visa Prepaid Card is issued by MetaBank®, Member FDIC, pursuant to a license from Visa U.S.A. Inc. Netspend, a TSYS® Company, is an authorized Independent Sales Organization of MetaBank. Card may be used everywhere Visa debit cards are accepted. Certain products and services may be licensed under U.S. Patent Nos. 6,000,608 and 6,189,787. Use of the Card Account is subject to activation, ID verification, and funds availability. Transaction fees, terms, and conditions apply to the use and reloading of the Card Account. See the Cardholder Agreement for details. TSYS and Netspend are federally registered U.S. service marks of Total System Services, Inc. All other trademarks and service marks belong to their owners.